The third day of Megacon Orlando was the busiest of them all. Of course this meant plenty of amazing panels to check out. Indeed, my biggest complaint about the third day of the convention was that multiple panels I wanted to check out happened in the exact same time slot. The first panel I attended was another writers workshop. I had been so pleased with what I had learned at the prior panel that I decided to see what more information I could gain from this second time around. The topic this time around was primarily focused on how to be inclusive with writing. This is an incredibly important topic for me as with my fiction writing, I try my best to keep inclusiveness in mind. Indeed, being a writer is what originally gave me interest in Megacon. I asked a specific question at this panel about how to not try too hard to insert character traits into a story. There were prior examples of writers demonstrating inclusive characters. There had been both good and bad examples of such works bringing LGBT into the mix such as Harry Potter and Legend of Korra. However, little had been asked about how to overcome this problem. All the panelists gave different answers to this complex question. However, the best way to sum up their advice is actually pretty simple. The answer to this riddle was to writer characters with more than one trope in mind. If a character is going to be LGBT for example, do not make this their one quality that they are defined by. Indeed, looking at some of the better examples made me realize that this was the biggest reason why I viewed them as such great characters in the first place. Before I continue, I want to make note that the next panel I attended was with John Cena. And despite being (probably) invisible, I did get a chance to hear him speak. However, that panel warrants its own article. I am mentioning it here for the sake of accuracy. I was not the only writer at Bentobyte on hand and I am allowing one of my peers to write the article and give it justice. With that in mind, I’ll move on to the next panel I attended. On day one while speaking to Mark Meer he let me in on a little secret. Despite not being listed in the event, he was attending this panel. 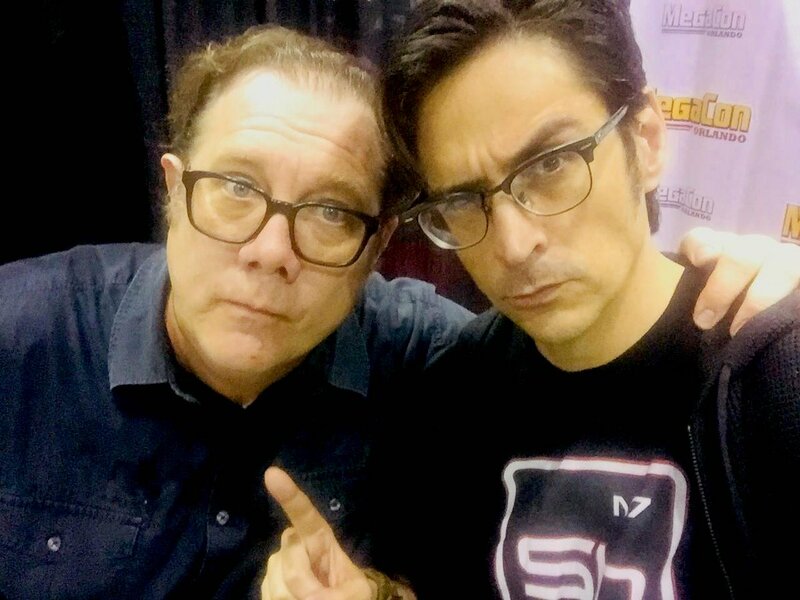 Fred Tatasciore the voice of Saren in Mass Effect would also be there. I did not know what exactly was going to happen here, but just for the chance to see these two voice actors in action, I went to check out this comedy event. There were a few other surprises as well. Vanessa Marshall known for voicing Hera Syndulla in Star Wars Rebels was part of the action. Another voice actor that I was not even aware was present at Megacon that was part of the panel was Jeremy Shada. He is most well known for vocing of Finn from Adventure Time. Finally, another unexpected voice actress that was part of the panel was Susan Egan most well known for the voice of Megara in Disney’s Hercules. With this outstanding group of voice actors, I eagerly awaited to see what silliness would ensue. The group was reading random parts from Back to the Future. And as it turned out, they were changing up their voices for every single fragment they read. This led to some really funny moments such as when Shada read his lines like Batman from the Dark Knight. Another part that put a smile on my face was hearing Tatasciore read his lines in Donald Duck’s voice. At one point Tatasciore read some lines about dating advice. What made this moment so hilarious was that he was doing this in Bill Cosby’s voice. It was amusing to say the least that something positive was born out of all those lawsuits. One final moment of comedy gold was when both Marshal and Egan both embraced their inner Disney Princess and sang all their lines. In contrast, Meer was using his famous Commander Sheppard voice and Tatasciore was speaking in the voice of former president Barack Obama. All in all, this ended up being one of my favorite panels of all Megacon. The next panel was all about Anime’s most iconic parody character. I was curious to see if Mittelman could answer all the question in one word. I had only recently seen One Punch Man admittedly. And for the longest time, I had not been a big fan of it. But I had given the show another go after watching far more Anime. The newfound appreciation for One Punch Man greatly contributed to me also enjoying this panel. This panel had the same format as the many Dragon Ball Panels I had attended earlier in the week. What this meant, was that the microphone moved around the room so that audience members could as questions. After seeing this system in motion, I admittedly prefer it to the lone microphone in the center of the room. It is much easier to raise your hand and have the microphone come to you in my opinion than waiting in line for a chance to speak. I had to suppress many groans during this panel. Not because of the speaker, but because so many questions involved One Punch Man vs Some other character. Every time Mittleman would point out that One Punch Man was a parody character However, this did give me an idea of a question to ask him. A second potential question to ask him arose later when he deviated from One Punch Man for a moment. Instead, he spoke about some other roles such as voicing a few less prominent characters in Fire Emblem. As a longtime fan of that series, I was a little saddened that I had not been aware. However this gave me incentive to go speak to him later in the event. I returned to the sales floor for the remainder of the third day of Megacon. The third day of Megacon was by far the most exhausting given the number of people there as well as the long lines. It was outright impossible to approach anyone at their table to be able to talk to them for more than a few minutes. I especially did not want to take time away from another potential fan. Given that many people were only able to attend for one day and I had the freedom of the entire convention. With this in mind, I noted the people I wished to speak to on the fourth and final day. The final Day was upon Megacon and just because it was once again a calmer and quieter day, did not mean the quality of events had decreased. I was recommended by a friend at Megacon to check out this panel. I had never heard of this sketch group before, but am a fan of sketch comedy in general. So looking to check out something different, I took said friend’s advice and watched. The first skit went off with a rocky start because of the requests from the audience. The panelists started by asking for random words from the audience, and given the creative nature of attendees of Megacon this turned into a complicated affair. I did not help matters since when the requests became “A phrase” I got in on the creative fun. I contributed: “Yielding to the Power of Thanos.” I’ll admit, I had no idea how they were going to make use of this phrase. The second part of their act was far better. The sketch group called up two members from the audience. Once on stage with the comedians, these guests had specific instructions. The comedians could only move with help from these two people. Basically the performers were puppets and the audience members their masters. This was much funnier since the comedians would constantly point out what they needed to do but would do so in exaggerated ways. I left the prior panel early. I desperately wanted to ensure I got the best seat possible at this next panel. In case it has not been made apparent by this point, I am a huge Mass Effect and Dragon Age fan. It was obvious that I would be present at this panel. However, I correctly guessed that many others would also be willing to wait in a long line to see the voices of Commander Sheppard and Saren Arterius. Luckily, I got a seat right near the front, and one of the panels that I had eagerly awaited began in earnest. One of the most surprising things I learned almost immediately was that these two voice actors had never been at a panel together before. Considering the sheer number of roles in video games they have voiced together, I could not believe it. Another highlight was when Mark Meer told the story of his relationship with the voice actress of the reporter, Khalisah al-Jilani from the first three Mass Effects, . Referencing the conversation I had had with him a few days prior made me really happy. Its a great feeling when a person you respect greatly acknowledges you. Anyway, he once again told the story about how Banigan’s brother was the best man at his wedding. The rest of audience found it just as amusing as I did. During the majority of the panel, I stood eagerly in line for a chance to be at the asking microphone. Unlike many of the other panels the microphone was in a stationary. Once I reached the front, I quickly decided which of the many questions I wanted to ask these talented voice actors. And I wanted to ask a question relevant to them both. I asked about whether they have voiced roles where they were surprised by a sudden plot twist. I brought up Virmire as an example from the first Mass Effect. Both panelists laughed at the question. Not because it was foolish but because most of their roles have either been voice the grunts of the random monsters or the main characters. Mark Meer explained that the people voicing the main characters tend to be told important plot points. Voicing a protagonist of a story requires greater knowledge of the plot. That way, a voice actor can properly become the character. As Megacon began coming to a close, I went to the Guest Tables one last time. The crowds being small again, just like on day one. I figured this would be a great chance to speak to the voice actors one final time. Given that Max Mittleman’s line was short, I decided on talking to him. He was a very approachable man for starters. I have learned that the best way to have conversations with big names is to treat them like people and not simply icons. I spoke to him about how I cringed whenever people asked him abut the One Punch Man vs Other Characters questions. He laughed and agreed that people did not seem to understand how parody characters work. I did however ask him what would happen if One Punch Man met another parody character such as Squirrel Girl. We both had a laugh about the hypocrisy of my question, but afterwards we had an amusing conversation about this. He admitted that no one had ever brought up Squirrel Girl before. One Punch Man has problems with Swarm attacks. This is how Squirrel Girl Fights. Next we talked about Fire Emblem. He was glad to talk about other characters besides Saitama since he has voiced many other roles. I asked him about the character Gray who he voiced in Fire Emblem Shadows of Valentia. Specifically I mentioned that the character is seen as an in universe troll. As it turned out, Gray was written that way in the Japanese script as well. Megacon was quite an event this year. The panels were quite diverse. Although I could not see them all, I did get a pretty good taste of what the event offered this year. There were quite a few people I was excited to hear speak. And there were even more people I did not get to see or interview. But there will be more conventions for me to attend. This also means more chances to speak to and interview these individuals.